Congratulations! You are one among the 37 million Americans who are currently in the throes of sinusitis. Think of it as a cold/allergy with a vengeance. It lasts longer than the common cold or even an allergy and sure does cause a lot more suffering than both put together. And if you think that is awful, here is where the bad news gets worse. The common cold, seasonal allergies, physical blockages in the nose, any type of upper respiratory tract infection and even a tooth/gum infection can end up causing sinusitis. In essence, sinusitis is out to get you regardless of whether the mercury is plunging or soaring and whether you have been spending your time indoors or outdoors. Now, you can either play victim to sinusitis and suffer in agony for weeks, or you can show that dreaded infection who’s the boss. I know most of us turn into a swiveling, coughing, wheezing mess when sinusitis hits. But, not this time! Because from now onward, you will have a formidable ally. She goes by the name of Mother Nature, and she knows exactly how to send sinusitis packing. So, don’t gulp in that cold or pain pill or even your allergy meds just yet! Continue reading to know how you can use all natural and 100% “side effect- free” methods to treat and even cure sinusitis. As always, we will start by discussing the ailment. 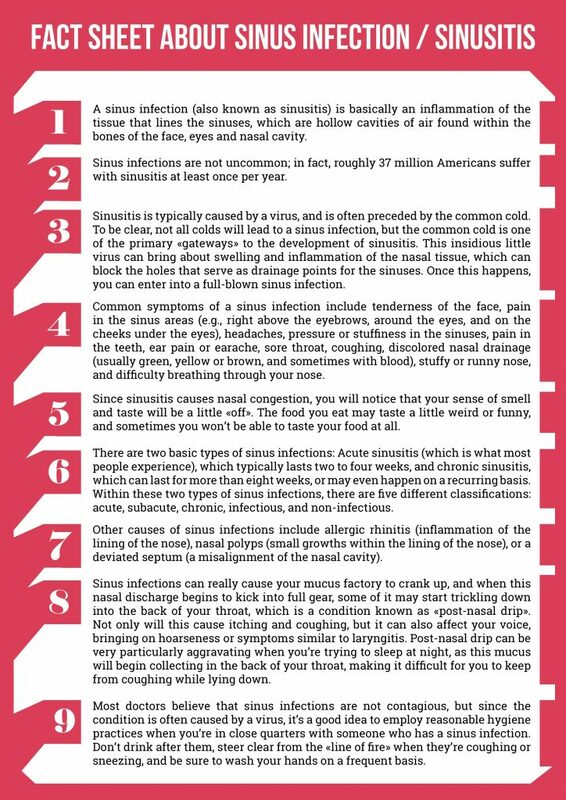 The two images below show 18 facts about sinus infection. The sinuses are indentations in the skull that not only contribute to your voice quality but also to the health of the upper respiratory tract. These pockets and the channels that connect them to the nasal passage are lined with mucosa that secretes the fluids needed to keep the insides of your nose nice and moist. And, why does your nose have to be wet on the inside? Simple, it handles a lot of air, and this moisture not only acts as your body’s own humidification system but also prevents the dehydration of the nasal tissue. Plus, it is the perfect slimy trap for dust, allergens and even germs. In essence, that is one well-snotted mechanism you got in there and everything flows along as it should till a spanner is thrown in the works. This spanner is inflammation! It causes the mucosal lining of the sinus cavities and the channels to swell up. As the channels become smaller, the mucus gets trapped inside the cavities instead of flowing out into the nose. The fluid accumulation offers a welcoming environment to pathogenic critters and within a matter of hours you have a full blown infection on your hands. What makes matters worse is that the inflammation and infection does not stop the production of the mucus. So, you essentially have a case of “a lot of fluid with nowhere to go”. Pressure begins to build inside the sinus cavities, and that is how you end up with the stuffy nose, dull but persistent headache, tenderness in the cheeks, fever and other signs of respiratory infection. Is it an Allergy? Is it a Cold? Is it Sinusitis? As discussed above, sinusitis can be infective or allergic in origin. So, there is understandably a lot of overlapping in terms of the symptoms between the common cold, allergic rhinitis and sinusitis. So, how will you know what exactly ails your schnozzle? Itching will be the definitive symptom. Your nose and throat will be itchy while your eyes will itch and water, which rarely happens in sinusitis. All that itching will cause you to sneeze and cough, which will lead to a sore throat. It will take some time for the sense of smell to get affected as this only happens when the inflammation worsens and infection steps into the picture. Nasal discharge, if any, will be watery and clear. Also, you will only begin to experience the symptoms upon exposure to an allergen. Antihistamines will offer quick relief from the symptoms of allergic rhinitis but sinusitis will not respond too well to the medication. You will have a runny and a stuffy nose but the discharge will be clear/white/cloudy although it can be more viscous. The common cold is a result of a viral infection that affects the entire upper respiratory tract. So, you will also have other symptoms such as cough and possible chest congestion or at least some amount of phlegm expulsion with cough. A sore throat and low grade fever are bound to follow along with fatigue and a general sense of malaise. The good news is that the symptoms peak between day 3 and day 5, and after this, patients experience a dramatic improvement in their condition. Because you are dealing with a viral infection, antibiotics do not help with dealing with the common cold. Antihistamines and NSAIDs may provide some reprieve because they impact the body’s inflammatory response. You sure won’t have a runny nose because the trouble starts when the mucus gets stuck in the sinus cavities. That said, you will have a stuffy nose and facial pain. The sides of the nose as well as the area of the forehead right above the eyebrows will feel tender to touch. You will also feel some amount of pain behind and at the corner of the eyes. Nasal discharge will be thick and yellow or greenish in color, which is an indication of a worsening infection. 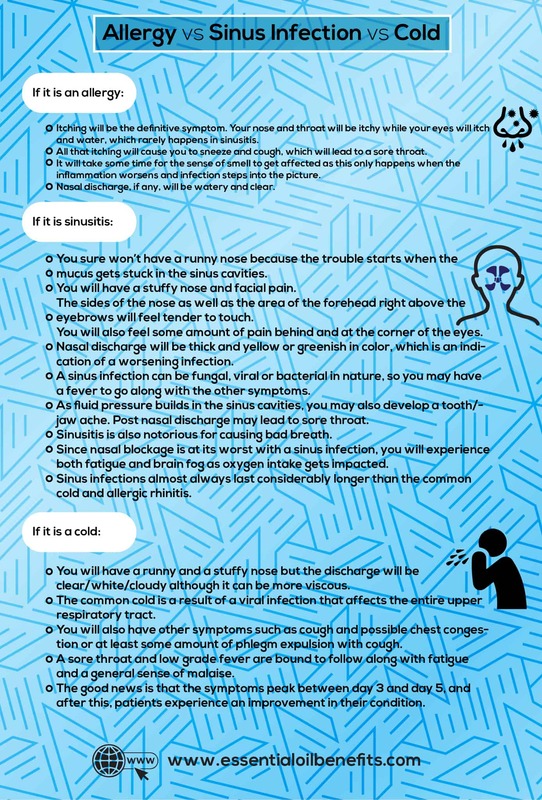 A sinus infection can be fungal, viral or bacterial in nature, so you may have a fever to go along with the other symptoms. As fluid pressure builds in the sinus cavities, you may also develop a jaw/tooth ache. Post nasal discharge may lead to sore throat. Sinusitis is also notorious for causing bad breath. Since nasal blockage is at its worst with a sinus infection, you will experience both fatigue and brain fog as oxygen intake gets impacted. Sinus infections almost always last considerably longer than the common cold and allergic rhinitis. Fact: patients with allergic rhinitis can have an improved quality of life through inhalation of essential oils such as sandalwood, frankincense and ravensara. Sinus infections are classified on the basis of the trigger that leads to the inflammation and the duration of the problem. Think of this as your first or a sudden brush-in with sinusitis. 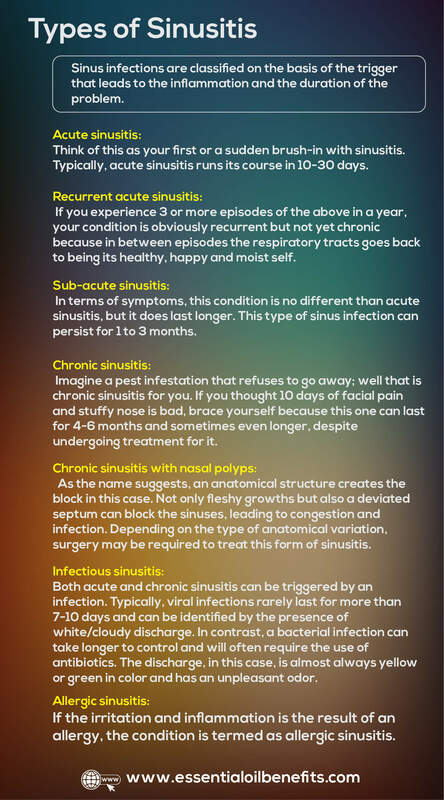 Typically, acute sinusitis runs its course in 10-30 days. If you experience 3 or more episodes of the above in a year, your condition is obviously recurrent but not yet chronic because in between episodes the respiratory tracts goes back to being its healthy, happy and moist self. In terms of symptoms, this condition is no different than acute sinusitis, but it does last longer. This type of sinus infection can persist for 1 to 3 months. Imagine a pest infestation that refuses to go away; well that is chronic sinusitis for you. If you thought 10 days of facial pain and stuffy nose is bad, brace yourself because this one can last for 4-6 months and sometimes even longer, despite undergoing treatment for it. Unlike other forms of sinusitis, the inflammation in this case persists long after triggers like infection and allergy have been treated. The precise cause of the long standing inflammation continues to elude experts. However, it is thought to be a result of consistent hyper-immune response to fungal spores. As the name suggests, an anatomical structure creates the block in this case. Not only fleshy growths but also a deviated septum can block the sinuses, leading to congestion and infection. Depending on the type of anatomical variation, surgery may be required to treat this form of sinusitis. 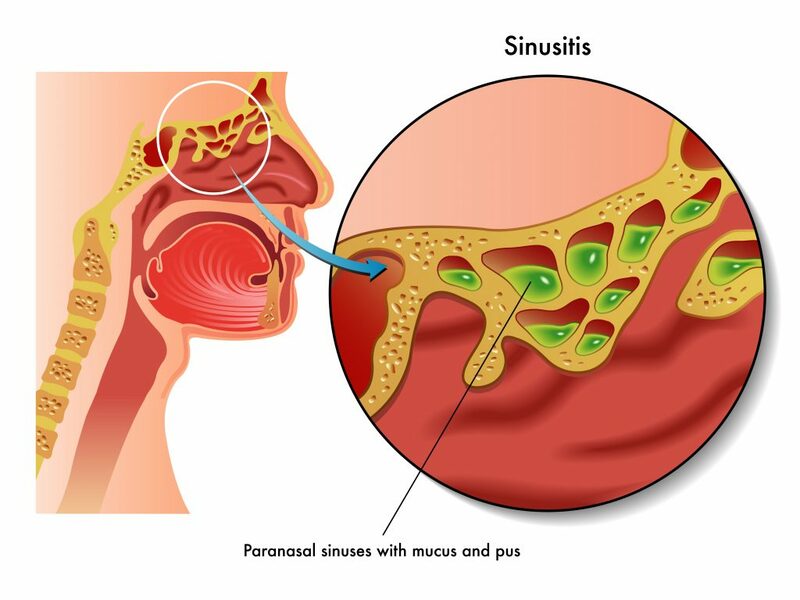 Both acute and chronic sinusitis can be triggered by an infection. Typically, viral infections rarely last for more than 7-10 days and can be identified by the presence of white/cloudy discharge. In contrast, a bacterial infection can take longer to control and will often require the use of antibiotics. The discharge, in this case, is almost always yellow or green in color and has an unpleasant odor. If the irritation and inflammation is the result of an allergy, the condition is termed as allergic sinusitis. Unbeknownst to you, the harbingers of sinusitis are lurking in close vicinity! It is not always the weather or even the air conditioning in the office that is to be blamed for the stuffy nose and the pressure pain of sinusitis. Often, the triggers that eventually lead to sinus inflammation and infection are hiding in the nooks and crannies and even in plain sight in your own home. 1. Dust is the undoing of those sinuses: Breathe in dust and your nose will make a show of its disapproval with a few bouts of sneezing even if you don’t suffer from sinusitis. So, imagine what happens when temperamental sinuses meet dusty upholstery, carpets and bedding! 2. You could be vacuuming your way to sinusitis: Your vacuum cleaner may be the actual trouble maker if you are working with a dirty filter. 3. Mold from inside your home to inside your nose: A sneaky problem that is more common than you care to admit – that is mold for you. Even a bit of dampness is an invitation for those spores to thrive and wreak havoc on your sinuses. 4. The four legged suppliers of hair and dander: The unconditional love of a furry friend can work wonders for your emotional wellbeing, but the hair and dander the animals leave behind can spell trouble for the sinuses. Of course, you don’t have to ditch your pets, but keep them well groomed, out of the bedroom and off the bedding and couches. Also, spend some extra time vacuuming their favorite spots around the house. 5. It smells good, but what about your nose: Your favorite perfume may not find favor with your sinuses, particularly if you start reeking of it and spray it liberally in an unventilated or enclosed area. 7. Swimming may not sit well with your sinuses: The chlorine in the water will often make your sinuses go berserk and if the mucus membrane escapes the chemical attack unscathed, water can cause pressure changes in the sinus cavities leading to pain and inflammation. 8. Et tu Mother Nature: Fresh blooms are easy on the eyes but hard on the nose because they bring along pollen. Similarly, many houseplants send their own blend of allergens in the indoor environment through their sap. So, pick your indoor plants wisely and stick to faux blooms if you have finicky sinuses. Do You Need To Seek Medical Help For Sinusitis? If you are suffering from acute viral rhinosinusitis, the symptoms will usually subside within 7-10 days. But if the stuffy nose, pain and fatigue continue to haunt you after 2 weeks, call on your doctor to know what’s bothering your snot maker. Although sinusitis may feel much like the common cold, it is hardly as harmless. If your symptoms seem to be worsening or if you cannot control them with OTC painkillers, decongestants and antihistamines, play it safe and seek help from your GP. A worsening infection announces itself with a low grade fever, increase in pain, facial swelling, sore throat, difficulty in breathing and swallowing, vision changes and very thick and colored nasal discharge. See your doctor at once if you have any of these symptoms. 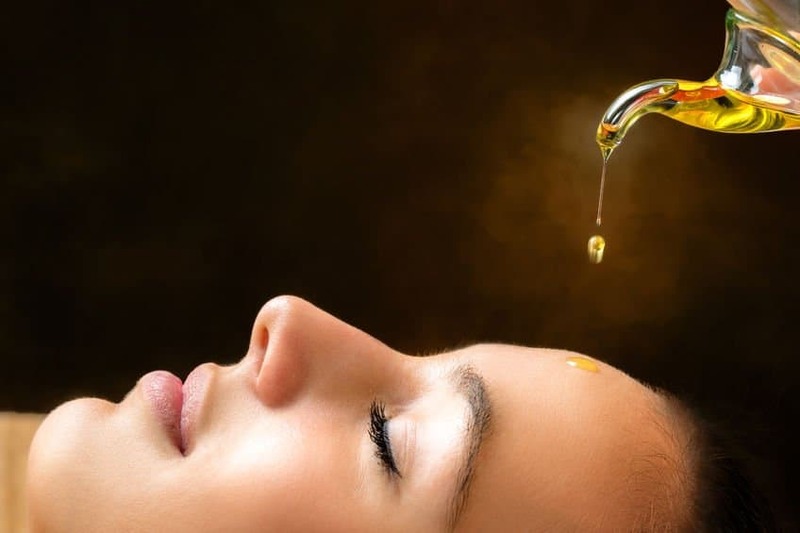 Why Are Essential Oils The Best Option For Treating Sinusitis? 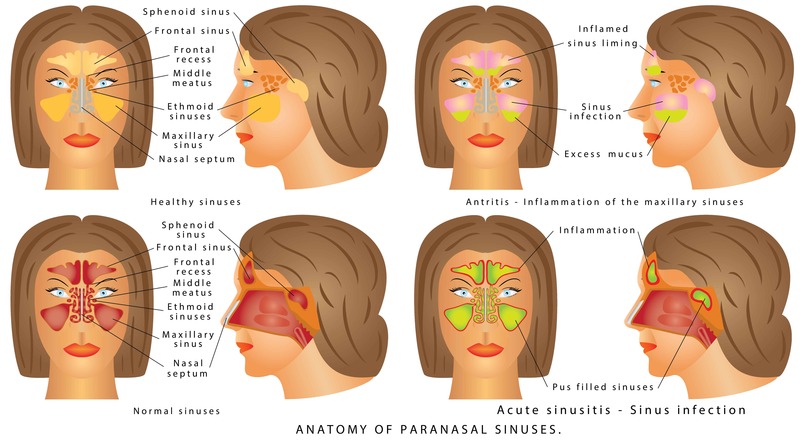 Think about what the crux of the problem is when you are dealing with sinusitis. Did I hear you say INFLAMMATION? Yes, that is indeed the starting point of trouble. So, as long as you can keep the inflammation in check, you will have a grip on the workings of your sinuses. And as far as anti-inflammatory properties are concerned, nothing out there can hold a candle to essential oils. That said, these aromatic extracts can deal with just about every trigger of sinusitis, be it a pathogen or an allergen. While antibiotics can only help in case of bacterial infections, essential oils offer broad spectrum antimicrobial effects. So, whether your sinuses have taken umbrage to the presence of a virus, a fungus or a bacteria, you can trust essential oils to kick the obnoxious critter out of your body. And that is not where the benefits end. For sinusitis that is triggered by allergies, antihistamines are the go to treatment. However, even 2nd generation drugs in the category are known to cause drowsiness and have anticholinergic effects (means they are bad for your noggin if taken too often). In contrast, essential oils offer all the benefits of antihistamines without the dreadful side effects. 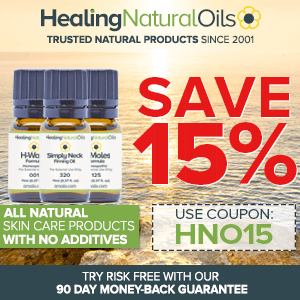 Make no mistake, although all natural, these aromatic extracts are extremely potent immunomodulatory agents that can stop inflammation even before it becomes a part of the sinusitis equation. Above all, the aroma of some of these oils can actually improve your focus, help you to think on your feet and make you feel energetic. And I have saved the best for last. It’s a well-known fact that antibiotics should be used with extreme discretion when dealing with sinusitis given the ever present and very real risk of bacterial resistance. But, essential oils have no such detrimental issues. This is an age-old, tried and tested treatment option that works, and works almost immediately. 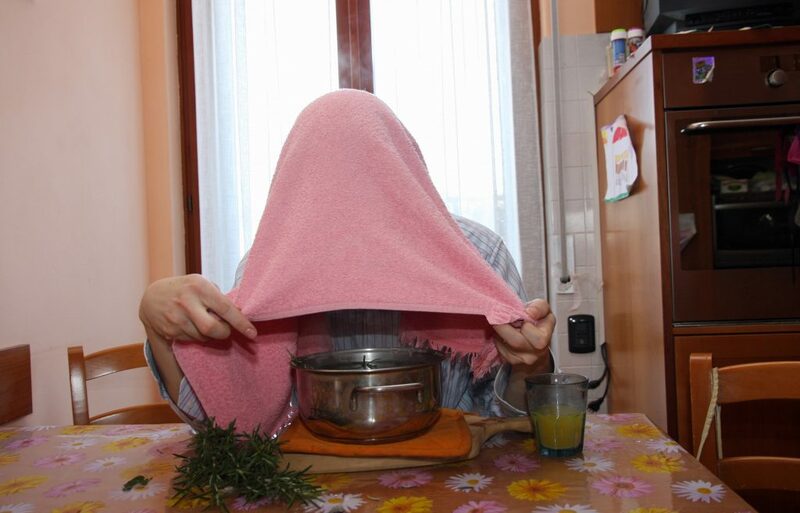 The steam helps to loosen the plug of thickened mucus that block the sinus ostia (openings) and it offers some much needed hydration to the over-worked mucosal lining of the nose and the sinuses. Fill a medium sized salad bowl with boiling water. Wait for a minute and add the oils to the water. Keep your face about 7-10 inches away from the surface of the water and cover your head with a towel, to increase your exposure to the steam. Breathe in deeply. When it comes to treating sore sinuses, the only thing better than water vapor is hot salt. 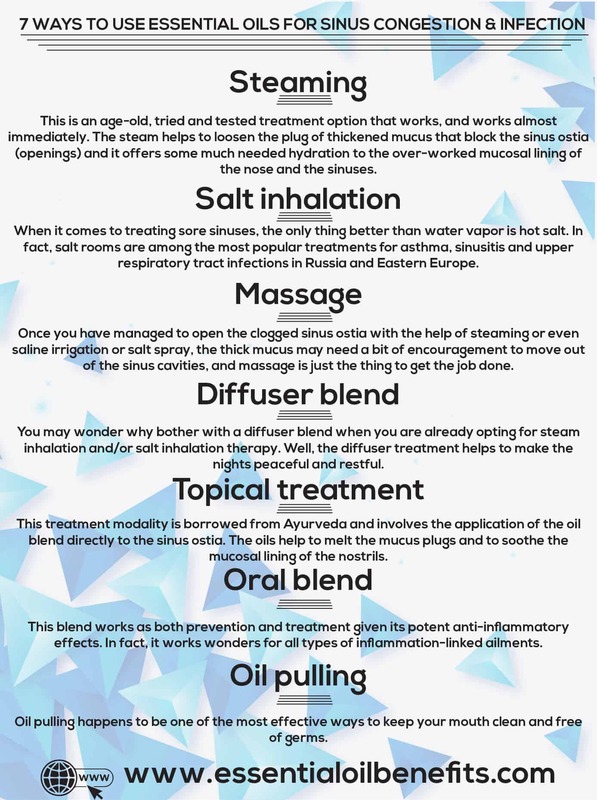 In fact, salt rooms are among the most popular treatments for asthma, sinusitis and upper respiratory tract infections in Russia and Eastern Europe. Halotherapy, as it is known, is based on the rationale that the tiny salt crystals you breathe in help to dislodge the mucus build up in the nose and even in the lungs. Although there is plenty of anecdotal evidence to support their efficacy, doctors remain unconvinced while people all over the world make a beeline for salt rooms. The biggest concern expressed by experts is that breathing in hypertonic salt (high quantities of salt) may actually trigger an inflammatory response. Well, too much salt may be a problem in a commercial salt room where the environment is artificially infused with hypertonic saline solution. But, here is a simpler and less expensive approach that pretty much eliminates the risk of overexposure while giving you the added benefits of essential oils. This is what you will need for your “at-home” salt therapy session. Mix the oils and store in a dark glass bottle. Remove the salt in a bowl and heat in the microwave for 1 minute. Add 3-4 drops of the essential oil blend to the hot salt. Mix briskly and keep the spoon handy for use later. Keep the bowl of treated salt in front of you on a table. Bend your head forward and cover with a thick towel to entrap the vapor inside. Breathe deeply for about 15 minutes. You will feel the intensity of the oils reducing 5-7 minutes into the session. Mix the salt crystals using the spoon and you will get a few more minutes out of the oil blend. Alternatively, add 2 drops more of blend to the hot salt. You don’t have to discard the salt after use. Store it in a glass jar in a cool, dry place. For best results, use this salt-n-oil therapy 2-3 times a day while your symptoms are at their peak and then 1-2 times a day till they are completely gone. For preventative purposes, 2-3 treatments a week work exceptionally well. Salt therapy works better for infective sinusitis than allergic sinusitis. Once you have managed to open the clogged sinus ostia with the help of steaming or even saline irrigation or salt spray, the thick mucus may need a bit of encouragement to move out of the sinus cavities, and massage is just the thing to get the job done. Mix the oils and store in an amber glass bottle, away from direct sunlight, heat and moisture. Before using this oil, look online for a picture of the sinus cavities. The four largest are the two maxillary sinuses and the two frontal sinuses. The maxillary sinus cavities are in the cheekbones, placed on the sides of your nose and below the eyes. The frontal sinuses are in the forehead, right above your eyebrows, on both sides of the nose. Given their size, they have the potential to harbor the maximum amount of mucus and hence contribute the most to the infection and the pain. So, these are the areas that you will need to massage. Use the first three fingers of your hand to massage the frontal sinuses, using downward strokes that will help the fluid to move towards the nasal cavity. Do not rub back and forth; your strokes should be unidirectional and move sideways and downwards. For the maxillary sinuses, use one hand to hold the skin on your cheeks taut and with the fingers of the other hand massage the maxillary sinuses. Once again, use sideway and downward strokes to move the fluids towards the nose. Massage the frontal sinuses and each of the maxillary sinuses for 3- 4 minutes. Also work on the small sinus cavities (ethmoid and sphenoid) which are below your eyebrows and on the sides of your nose at the very top. Then, pinch your nose at the top of the bridge and move your fingers down to the tip while continuing to grip the nose in a pinch, as if squeezing the mucus out of your nose. Don’t use too much downward pressure when massaging the sinuses. After the massage, blow your nose gently to expel the mucus, one nostril at a time. 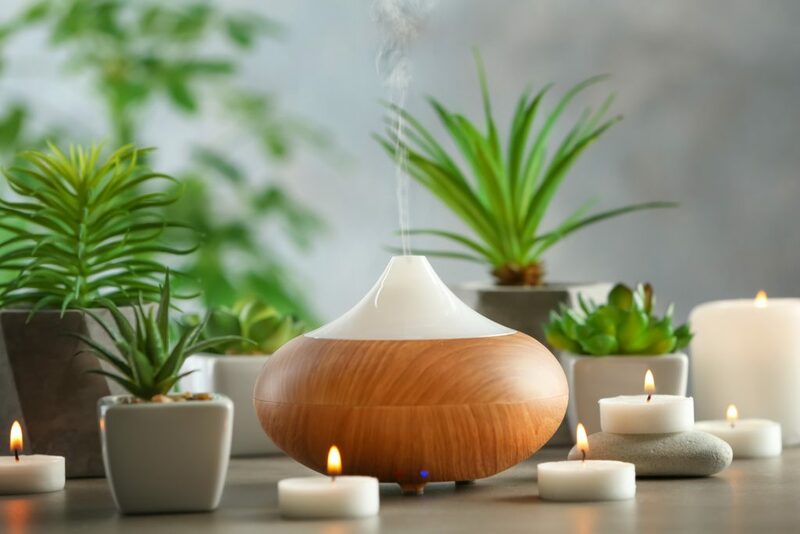 You may wonder why bother with a diffuser blend when you are already opting for steam inhalation and/or salt inhalation therapy. I am going to answer that with a question – A person who suffers from sinusitis can be spotted from across the room, do you know why and how? Simple, they look utterly miserable, with bags under their eyes, droopy eye lids and fatigue literally plastered on their faces. These tell-tale signs are attributed not just to the pain and the stuffy nose but also to the sleepless nights that come as a part of the deal. Preparation and storage as above. To use, add 7-8 drops to your diffuser and enjoy the relaxing vapor half an hour before bed time. Mix the oils and store in a dark glass bottle. Now, there are two ways to use this blend. The first involves the use of a Q-tip. Simply soak the Q tip in the blend and apply inside the nose, inserting the cotton tip as far inside as you can without provoking the sneeze reflex. The second method involves bending your head backward and administering a drop of the blend in one nostril first. Now, this can be a bit tricky to manage because under no circumstances are you supposed to breathe the blend in. This means you will have to consciously fight the reflex to breathe through your nose and focus on breathing through your mouth. Hold the drop of oil in your nose for 3-4 minutes and then gently blow just the treated nostril. Repeat the process with the other nostril. Use this treatment once a day till the symptoms subside. You can also use this treatment modality as a preventative measure. For this, change the recipe to 1 drop each of German chamomile and eucalyptus oil in 60 ml sesame seed oil. Use the blend twice a week to keep those sinuses on their best behavior. Open the capsule by separating the two halves. You will find that one half of the capsule shell is narrower than the other. Put one drop of turmeric oil in it and top with 0.5 ml of black seed oil (Nigella sativa carrier oil). Cover the capsule with the wider of the two halves and take immediately. The oil blend should be taken right before or after a meal. It is best to make just one capsule at a time. For best results, take one capsule/day for 30 days, every 3 months, when using the blend for prevention. So, that would be a break of two months in between 2 treatment courses. 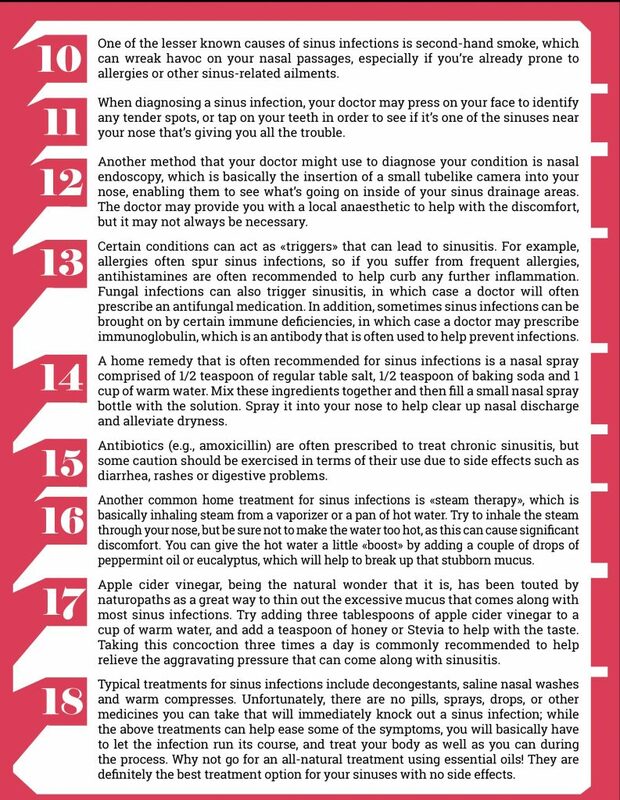 To treat sinusitis, use one capsule/day for 15 days or till the symptoms subside. Talk to your doctor/herbalist before using this blend if you suffer from chronic diseases of the heart, circulatory system, kidneys or the liver. You should not use this blend if you are pregnant or breast feeding. I bet you are wondering why and how oil pulling figures in this list. After all, we are talking about schnozzle and not buccal troubles here! Well, the mucous membrane that coats the inside of your mouth also goes down into your throat and up into your nose. So, if you have an infection in the mouth, there is always the risk of those critters travelling one floor up without an elevator. Add to this the fact that the germs in your mouth are responsible for a wide range of inflammatory disorders, and it is easy to understand why they need to be taken out of the equation. Oil pulling happens to be one of the most effective ways to keep your mouth clean and free of germs. Plus, if you add essential oils to the mix, you can increase the blood supply not only to the mouth and gums but also to the nasal cavity. Melt the coconut oil in a double boiler and then blend in the essential oils. Give the mixture a good whisk and store in a dark colored glass jar. You will need ½ to 1 tbsp of the oil for one round. Now, coconut oil is solid at room temperature and although it will melt within a matter of seconds once you put it in your mouth, it may feel weird. In fact, this was the most off-putting thing about oil pulling for me. I mean, I did not want to wake up to feeling a dollop of butter/solid oil in my mouth. So, if you are like me, simply remove a tablespoon of the oil in a small glass bowl and hold the bowl in a cup of hot water for a few seconds. It literally takes 5-10 seconds for the oil to melt, and the best part is that it is still at room temperature. Then, pour it into your mouth and swish it around for a good 5-10 minutes. I know all oil-pulling fans ask you to do 20 minutes, but even 5 will be hard to accomplish at first and 10 minutes will do just as much good, really. A bit of a warning here – your jaw will hurt after about a minute. So, instead of swishing that oil like your life depends on it; take it slow. If your jaw is protesting, stop, breathe and then start again. The only thing that you are not supposed to do is swallow the oil, but otherwise it is perfectly alright to take a breather. Personally, I like to give my neck some gentle exercise while I am at it, with neck bends, turns and chin tucks. This way, I kill two birds with one stone. But, you can do what works for you. Don’t stop for more than a few seconds in between rounds of swishing and no gargling with this oil. Once you are done, spit the oil out in the trash can and not the sink. Oil will clog your drains, so you need to be careful. Follow with a few rounds of salt water/simple warm water swishing and then brush your teeth, and that is all there is to it. Oil pulling should be done at least 4-5 times a week; of course, everyday works best. If you’re looking for some natural, holistic ways to alleviate sinus issues and clear your stuffy nose, below are 8 reliable home remedies to help you knock out sinus congestion. Breathing in hot water vapor is a great way to introduce moisture into the sinuses, which can help loosen up mucus and other natural debris in your nose. There are a couple of ways to do this: You can take a hot, steamy bath or shower, or you can just boil a pot of water on the stove and then carefully inhale the steam that comes from the boiling water. Just remember to exercise caution and inhale gradually at a safe distance so that you don’t burn your nose. As described above, you could also consider adding a couple of drops of eucalyptus oil or menthol into the shower, bath or pot of boiling water, as the vapor from these natural substances is well-known for alleviating congestion. Saline sprays and washes are one of the most reliable home treatments you’ll find for sinus congestion. Saline washes help to loosen up and thin out mucus, which can help flush it from your nasal passages and allow the free passage of air. As mentioned above, one of the most popular products on the market in this regard is a nasal irrigation system known as a Neti pot. This small container is designed to flush or rinse mucus and other debris from your nasal cavity. 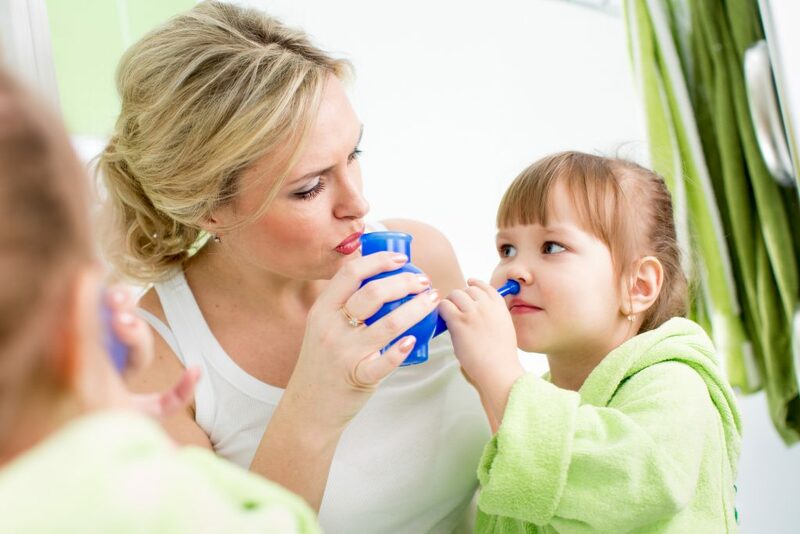 Scores of studies have shown that irrigating your nasal passages with a Neti pot can help to alleviate congestion, pressure, facial pain, another troubling symptoms that arise from inflamed sinuses. Bromelain is a natural protein that can be found in the stems of pineapples, and it has been used for years to reduce swelling in the nasal cavities. In fact, boxers have often used bromelain to diminish swelling after battling it out in the ring. You can purchase bromelain as a supplement in most health food stores, but be sure to check with your doctor first, as it might interact with other medicines. In addition, make sure that you always follow the dosing instructions that are outlined on the product label. By keeping the air moist, you can keep your sinuses from drying out and becoming inflamed. Be sure to install a humidifier in your bedroom, as it can really help you achieve a more peaceful sleep while you’re grappling with symptoms of sinus congestion. One important thing to remember is that you must keep the humidifier clean, as dirty humidifiers can produce mold. In addition, make sure to monitor the humidity levels in the room so that they don’t exceed 50 percent, and only use humidifiers during the months when the weather is dry. This is a good rule to follow whether you have sinus congestion or not, but it definitely comes in handy when you’re dealing with unpleasant sinus symptoms. The reason why is because staying hydrated will keep your sinuses moist, which helps to stave off inflammation due to dryness. Most experts recommend that you drink at least eight 8-oz glasses of water per day, and while you’re dealing with sinus symptoms, you might want to steer clear of caffeinated and alcoholic beverages as well, as they can cause dehydration. If you’re not sure whether or not you’re getting enough fluids, check the color of your urine – if it’s very light yellow to clear in color, you’re doing great, but if it’s dark yellow or brown, you need to drink a lot more water. Adding foods that pack a spicy punch can work wonders for opening up your nasal passages. Try horseradish, brown mustard, jalapeno peppers, curry, cayenne pepper, wasabi, etc., but be mindful of what your stomach is able to take – after all, you don’t want to bring on a bad case of indigestion while trying to get rid of sinus congestion. One of the easiest ways to bring short-term relief to sinus pain and congestion is to apply a hot or cold pack to the bridge of your nose. If you’re not sure which one to choose, just try both at varying times during the day and monitor the results. If you’re short on supplies but you need immediate relief, you can simply take a pack of frozen vegetables from your freezer, wrap a towel around it and apply it across your face. You can also put together a makeshift hot pack by dampening a washcloth, wringing it out and then heating it in the microwave for about one minute. After heating, lay it over your face, but be sure to check the temperature level of the washcloth so that you don’t get an unpleasant surprise. Home remedy enthusiasts have long extolled the virtues of peppermint, and drinking peppermint tea is one of the best ways you can benefit from this highly potent natural substance. Keep in mind that peppermint has a high menthol content, which is well known for its ability to open up the nasal passages and thin out mucus. By drinking peppermint tea, you receive the benefits of not only the peppermint and menthol, but also the steam from the warm liquid. In order to create an essential oil solution for use in a neti pot, add the essential oil of your choice, but no more than one to two drops. In a bowl, take a cup full of warm water (not too hot to burn the nasal tissues) and add one tablespoon of finely ground sea salt. Stir until the salt is dissolved and add the essential oil and mix well. Lean over the sink, turning your head on one side so that your ear is facing the sink. Gradually put the solution into the upper nostril, keeping your head stationary and drain that out from the other nostril. Make certain that you breathe through your mouth in order to do this process properly. Repeat with the other nostril. 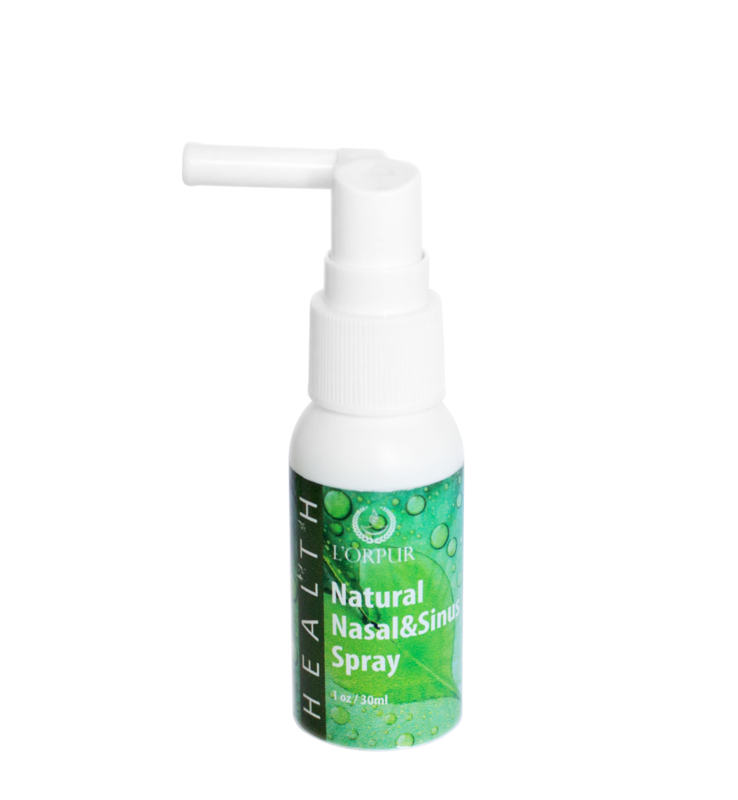 If you are looking for a natural product with organic ingredients for sinus/congestion relief, why not try my L’orpur Natural Nasal and Sinus Spray! It offers relief of all types of sinus conditions, sinusitis, sinus pain, sinus pressure, sinus and nasal congestion. In order to keep the discharge thin so that the mucus can drain easily, I strongly re-iterate that you drink plenty of water and avoid the consumption of alcohol at all costs as it can irritate your sinuses. Also, try to avoid dairy products such as cow’s milk that promotes mucus production. As you can see, there are several ways to address sinus congestion without immediately deferring to unnatural or synthetic substances. Keep the above natural remedies in mind to help you stave off the effects of sinus congestion. 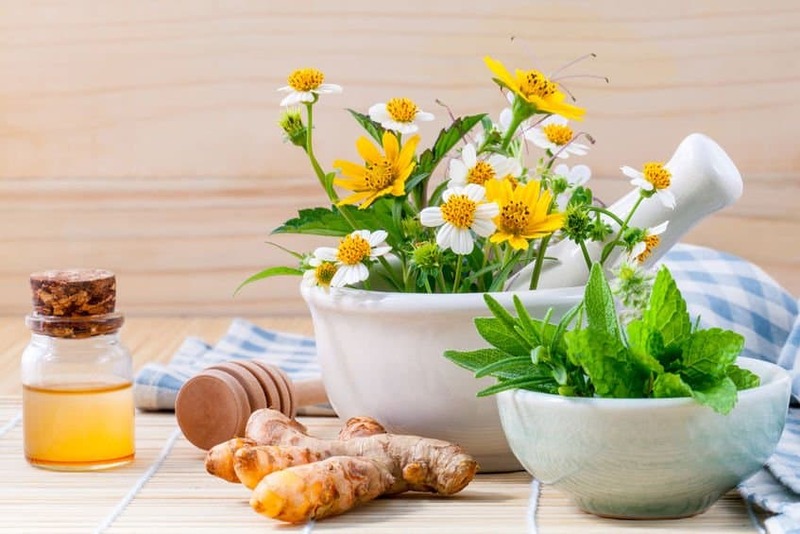 In case the use of essential oils or home remedies is not offering you the relief you were expecting, or if your condition is getting worse, get in touch with a health care professional immediately and have a proper diagnosis. How come no one mentions the MOBIOS ateam inhaler with essential oils? Can you please clarify your question as I don’t follow. The factsheet has been sent to your inbox. You can refer to the article below for more info. If that does not help, you’ll need to see your doctor. Hi again Olivia! I have another question. I am constantly clearing my throat because I have drainage that is constant. I drink lactose free milk bc I thought it was linked to dairy. But it doesn’t seem to help. Haven’t been to Dr yet bc I have horrible insurance. Any recommendations using your oils? Should I get a diffuser? Help! Thank you again! Indeed, it would appear it is post nasal drip. I would recommend you read this article and follow some of the recipes. Also drink extra fluids, avoid caffeine and make sure you have a diffuser running in your home/office during the day. This will help thin the mucus in your nose/sinuses. You will also need to consult your doctor as these may develop into ear ache, fever, headache, etc. 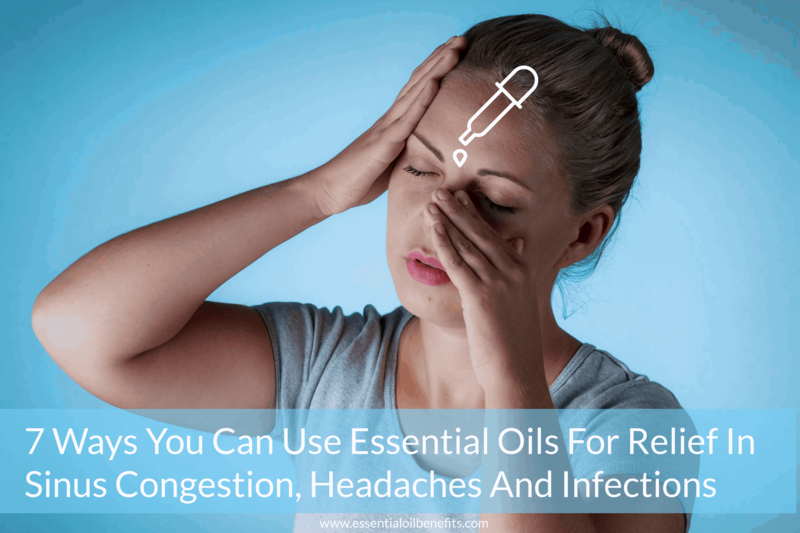 Hi,I check your blogs named “7 Ways You Can Use Essential Oils For Relief In Sinus Congestion, Headaches And Infections” like every week.Your writing style is awesome, keep doing what you’re doing! Just received the fact sheet about sinusitis, thank you, but done/doing all that. Had a different antibiotic. It’s not as bad but still there with post nasal drip. I can’t find the link to what essential oils would be helpful. Thank you for this great website. You’re welcome. 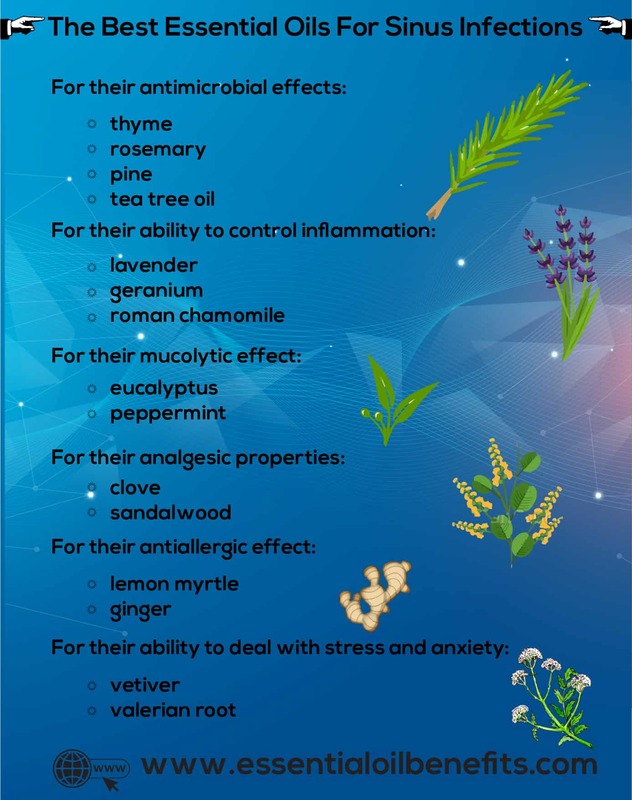 You can use various essential oils including eucalyptus, peppermint, tea tree, rosemary, etc. during the day and lavender essential oil at night for post nasal drip. Use them in the various ways described in the article. It is possible that your problem is fungal, like Candida. Good anti fungal oils include Tea Tree, Clove, and Lemongrass, to name a few. Just received the fact sheet about sinusitis, thank you, but done/doing all that. Had a different antibiotic. It’s not as bad but but still there with post nasal drip. I can’t find the link to what essential oils would be helpful. Thank you for this great website. Glad to read all this, , even my doctor advice me to try essential oils! Sure, if you are after an all-natural treatment for various ailments, essential oils is the way to go. Thank you for this… currently steaming my sinuses and running my diffuser (in a different room) to help clear my head and clean up the air in my rooms (one at a time). I am subbing Tea Tree oil for Thyme as I was out of Thyme and still works like a charm. You are so welcome. Thank you for sharing your experience with both Thyme and Tea Tree Oil for sinuses. How much dosage is safe for 12 months old baby? I would recommend not to use essential oils for a baby of this age. It is best to seek medical advice. I never applied essential oils to my children until they started Kindergarten. I did use them in the humidifier though. My children seem to appreciate the calming Rosemary oil best. Each child knows what they like… test a few in a diffuser before dropping a lot in the humidifier. Also, I cut the drops in half so it was not over powering for their sensitive systems. You followed the correct procedure. Since kids’ bodies (organs, etc.) are still developing and sensitive as you mentioned, it is best to use a higher dilution rate when it comes to essential oils. Thanks for sharing your experience of essential oils with kids. It is ok, it is about the quality of the oils, but apply to the babies feet instead! And use about half what you would use for an adult. It would be preferable to cut the ratios of essential oils by a third to half. You may start with a lower concentration and then increase them slightly, if required depending on what works for the sinus colds. If you are doing topical application, remember to do a test patch beforehand to make sure there is no adverse skin reaction. Also, avoid oral consumption due to their age. If you need more help, drop me a line. I used peppermint , tea tree and eucalyptus oil for congestion , it did sting me a bit but fav me a great relief from congestion. Thanks for sharing and indeed a great mix of essential oils to deal with sinus congestion. Peppermint essential can trigger a migraine in me so if you get smell triggered migraines you might want to leave that one out. Tea tree and eucalyptus do not bother me at all. Thanks for sharing the info., I really appreciate it. Thank you for sharing your article. This could be very helpful. Your welcome Olivia. Keep on posting significant articles. What essential oils to use in the Neto pot for sinus infection? You can use a few drops of eucalyptus or peppermint essential oil. I use a Neti Pot with salt water. I use about 1/2 teaspoon of fine salt, specially sold for the neti pot, for each cup of water. Six tablespoons of salt does not sound right! Unless I am misunderstanding your recipe….. Thanks for pointing out the obvious. It should be one table of salt for the neti pot, so about half tablespoon per cup of water is correct.